Extra-comfortable due to being made without any bulky seams whatsoever, these ladies Elle Striped Seamless Bamboo Shoe Liner Socks are the ideal accompaniment to summer shoes. They’re very breathable and stay fresh for longer due to bamboo fibre’s antibacterial nature, which also allows them to absorb three times more moisture than comparable cotton liners. 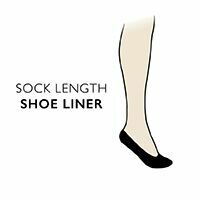 Elle Striped Seamless Bamboo Shoe Liner Socks have extra-low profile edges, both for comfort and invisibility in shoes, and added silicone strips inside the heel area to stop your socks from slipping underfoot.